Have you ever wondered what's actually happening when you're cooking food? While this is something that we usually take for granted, this process of heating food - known as heat transfer - is complicated and fascinating. Keep reading to learn more about the relationship between heat transfer and cooking and the important role it plays in your kitchen. Heat transfer is an exchange of thermal energy between two objects. The rate of heat transfer depends upon the temperatures of each entity and the medium through which the thermal energy is being transferred. In cooking, heat transfer refers to heating your food items through a cooking appliance, such as a stove, fryer, microwave, or oven. How is Heat Transfer Used in Cooking? Heat transfer is a very important aspect of the cooking process. Heating food destroys potentially harmful bacteria and other microorganisms, which makes food safe to eat and easier to digest. When food or liquids become hot, their molecules absorb energy, begin vibrating rapidly, and start to bounce off of each other. As they collide, heat energy is produced and transferred, which warms and cooks our food. Each of these methods features its own unique characteristics, but there is also some crossover between the different types. Conduction is the process of heat being transferred between objects through direct contact, and it's the most common type of heat transfer. 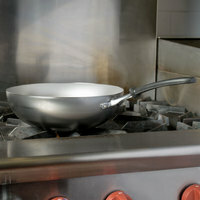 For example, in cooking the burners on stoves will conduct heat energy to the bottom of a pan sitting on top of it. From there, the pan conducts heat to its contents. A deep fryer also uses conduction heating as the hot oil cooks the food when it comes into direct contact with it. Additionally, conduction heat is responsible for moving heat from the outside of the food to the inside. As a result, conduction heat also happens when cooking with convection and radiation heating methods. Conduction is the slowest method of heat transfer, but the direct contact between the cooking surface and the item to be heated allows food to be cooked from the outside in. When cooking a steak in a cast iron skillet, for example, conduction produces an evenly cooked exterior and a moist, juicy interior that guests are sure to love. Convection combines conduction heat transfer and circulation to force molecules in the air to move from warmer areas to cooler ones. As the molecules closest to the heat source become warm, they rise and are replaced by cooler molecules. There are two types of convection that are based on the movement of the heated molecules. Natural convection occurs when molecules at the bottom of a cooking vessel rise and warm while cooler and heavier molecules sink. This creates a circulating current that evenly distributes heat throughout the the substance being prepared. For example, when a pot of water is placed on the stove to boil, conduction heat warms up the pot, which then heats the water molecules inside. As these molecules heat, convection causes them to move away from the interior of the pot as they are replaced by cooler molecules. This continuous current creates convection heat transfer within the water. Mechanical convection occurs when outside forces circulate heat, which shortens cooking times and cooks food more evenly. Examples of this include stirring liquid in a pot or when a convection oven uses a fan and exhaust system to blow hot air over and around the food before venting it back out. In cooking, radiation is the process where heat and light waves strike and penetrate your food. As such, there is no direct contact between the heat source and the cooking food. There are two main radiant heat cooking methods: infrared and microwave radiation. Infrared radiation utilizes an electric or ceramic heating element that gives off electromagnetic energy waves. These waves travel in any direction at the speed of light to quickly heat food, and are mainly absorbed at the surface of whatever you're preparing. Examples of things that create infrared radiation are glowing coals in a fire, toaster ovens, and broilers. Microwave radiation utilizes short, high-frequency waves that penetrate food, which agitates its water molecules to create friction and transfer heat. If you're heating a solid substance, this heat energy is transferred throughout the food through conduction, while liquids do so through convection. Microwave heat transfer usually cooks food faster than infrared radiation, as it is able to penetrate foods several inches deep. Keep in mind that microwave radiation works best when cooking small batches of food. Whether you're using a pan on a stove, a convection oven, or a heavy-duty microwave, conduction, convection, and radiation are all around us. Knowing and understanding what heat transfer is, how it works, and which type of heat transfer is happening as you cook can help you better understand the science of cooking and improve your skills as a chef.